"Sir Bruce" redirects here. It is not to be confused with Bruce Woodcock (computer games analyst). Forsyth was born on Victoria Road in Edmonton, Middlesex (today part of the London Borough of Enfield) on 22 February 1928, the son of Florence Ada (née Pocknell) and John Thomas Forsyth-Johnson. His family owned a car repair garage, and as members of the Salvation Army, his parents played brass instruments and his mother was a singer. His great-grandfather Joseph Forsyth Johnson (1840–1906) was a landscape architect who worked in multiple countries, and great-great-great-great-grandfather William Forsyth (1737–1804) was a founder of the Royal Horticultural Society and the namesake of the plant genus Forsythia. During World War II, his older brother John, a pilot in the Royal Air Force, was killed in 1943 during a training exercise at RAF Turnberry. Forsyth attended the Latymer School. After watching Fred Astaire in films at age eight, he trained in dance in Tottenham and then Brixton. Forsyth started his live public performances aged 14, with a song, dance and accordion act called "Boy Bruce, the Mighty Atom". His first appearance was at the Theatre Royal in Bilston, with The Great Marzo at the top of the bill. He had made his television debut in 1939 as a child, singing and dancing on BBC talent show Come and Be Televised, broadcast from Radiolympia, and introduced by Jasmine Bligh. After the war, with the goal of joining Moss Empires theatres, he spent years on stage with little success and travelled the UK working seven days a week, doing summer seasons, pantomimes and circuses, where he became renowned for his strong-man act. His act was interrupted by call-up papers for National Service when he was conscripted into the Royal Air Force. 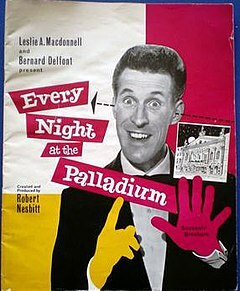 In 1958, an appearance with the comedian Dickie Henderson led to his being offered the job of compère of Val Parnell's weekly TV variety show, Sunday Night at the London Palladium. He hosted the show for two years, followed by a year's break, then returned for another year. His schedule of stage performances, which continued throughout the 1960s, forced him to give up the job of host. Forsyth appeared in the London production of Little Me, along with Avril Angers in 1964. In the musical film Star! (1968), a biopic of stage actress Gertrude Lawrence, he played alongside lead performer Julie Andrews as Lawrence's father. In January 1968 Pye Records issued as a single "I'm Backing Britain", supporting the campaign of the same name, written by Tony Hatch and Jackie Trent, and sung by Forsyth. The chorus included "The feeling is growing, so let's keep it going, the good times are blowing our way". All involved in making the single took cuts in their fees or royalties so that the single sold for 5s. instead of the going rate of 7s. 4½d. Forsyth happily endorsed the campaign, saying "The country has always done its best when it is up against the wall. If everyone realises what we are up against we can get out of trouble easily." The song did not make the charts, selling only 7,319 copies. On 7 October 1968, he was top of the bill on the opening night of the Golden Garter nightclub, Wythenshawe. Two years later, he played Swinburne in the Disney fantasy film Bedknobs and Broomsticks. In 1976, he appeared on The Muppet Show, where he took on the famous duo of Statler and Waldorf. During his spell of hosting Sunday Night at the London Palladium as part of the show he hosted the 15-minute game show Beat the Clock. Forsyth's next success was The Generation Game (BBC1, 1971–1977, 1990–1994), which proved popular and attracted huge Saturday evening audiences. It was on this show that Forsyth introduced his "The Thinker" pose, emulating Rodin's sculpture, appearing in silhouette each week after the opening titles. This pose is reminiscent of the circus strong-man attitude. He also wrote and sang the theme for the show "Life is the Name of the Game." Millions of viewers became familiar with the rasp of Forsyth's north London accented voice and his "distinctively pointy" chin that he emphasised in poses such as the "human question mark", with chin over raised knee. He was replaced on The Generation Game by Larry Grayson. In 1977 he announced that he was leaving television to take the star role in a new musical, The Travelling Music Show, based on the songs of Anthony Newley and Leslie Bricusse. The show did reasonably well in provincial theatre, but got bad reviews when it moved to London and closed after four months in July 1978. London Weekend Television persuaded him to return to the screen later that year to present Bruce Forsyth's Big Night, a two-hour Saturday-night show on ITV encompassing a variety of different entertainment formats (later reduced to 90 minutes). However, the show was not a success and lasted for just one series. Forsyth remained with ITV, hosting the game show Play Your Cards Right, which was the UK version of the US original Card Sharks, from 1980 to 1987, 1994 to 1999, and a brief period from 2002 to 2003, before the show was cancelled mid-run due to low ratings. In 1986, he went to the United States to host a game show on ABC, Bruce Forsyth's Hot Streak, which ran for 65 episodes from January to April that year. Forsyth starred in the Thames Television sitcom Slinger's Day in 1986 and 1987, a sequel to Tripper's Day which had starred Leonard Rossiter, whom Forsyth replaced in the new show. He was the original host of You Bet! (1988 to 1990), before the show reached mainstream success under the stewardship of Matthew Kelly. Forsyth fronted the third version of The Price Is Right (1995 to 2001). His unsuccessful gameshows include Takeover Bid (1990 to 1991), Hollywood Or Bust (1984), and Didn't They Do Well! (2004). During the 1970s Forsyth featured in the Stork margarine adverts on television, and then during the 1980s and 1990s he appeared in an advertising campaign for the furniture retailer Courts, in which he dressed as a judge. Forsyth celebrated his 70th birthday in 1998 and appeared in a week-long run of his one-man show at the London Palladium. In 2000, Forsyth hosted a revived series called Tonight at the London Palladium. In 2003, and again in 2010, Forsyth was a guest presenter on the news and satire quiz show Have I Got News for You. Forsyth had called Paul Merton, one of the team captains on the show, to suggest himself as a guest presenter. During the first of these appearances, he presented a parody of his Play Your Cards Right format entitled Play Your Iraqi Cards Right. He co-presented Strictly Come Dancing from 2004 to 2013, formally stepping down from hosting the regular live show in April 2014. This decision was made to reduce his workload and for the preparation of pre-recorded specials. On 7 April 2010, Forsyth became one of the first three celebrities to be subjected to the British version of the American institution of a comedy roast, on Channel 4's A Comedy Roast. Forsyth was the subject of the BBC genealogy series Who Do You Think You Are?, broadcast on 19 July 2010. On 20 March 2010, Forsyth appeared on the autobiography-interview programme Piers Morgan's Life Stories, which was broadcast on ITV. In 2011, Forsyth released a collection of songs on CD called These Are My Favourites. He chose the songs for their personal and musical importance, including a duet with his granddaughter, Sophie Purdie. These Are My Favourites also includes a recording of "Paper Moon" with Nat King Cole. Forsyth's showbiz awards include Variety Club Show Business Personality of the Year in 1975; TV Times Male TV Personality of the Year, in 1975, 1976, 1977 and 1978; and BBC TV Personality of the Year in 1991. On 7 June 1959 Forsyth was inducted into the elite entertainers' fraternity, the Grand Order of Water Rats, Water Rat number 566. In 1987, a fan club was created – the Great Bruce Forsyth Social Club. They would later go on to assist Forsyth in singing his opening number, "It's Never Too Late", at his Audience With show. He repaid this favour by adding the society to his busy schedule in June 1997 and appeared at their 10th annual general meeting in Plymouth. Forsyth was appointed Officer of the Order of the British Empire (OBE) in the 1998 Birthday Honours, and Commander of the Order of the British Empire (CBE) in the 2006 New Year Honours. On 27 February 2005, the BBC screened A BAFTA Tribute to Bruce Forsyth to mark the entertainer's 60 years in show business. He had a bronze bust of himself unveiled at the London Palladium in May 2005. The sculpture was created by his son-in-law and is on display in the theatre's Cinderella Bar. In 2008, Forsyth received the BAFTA Fellowship. In 2009, he was awarded the Theatre Performer's Award at the annual Carl Alan Awards. Hosted by the International Dance Teachers' Association, the awards are voted for by the leading dance organisations in the United Kingdom and recognise those who have made an exceptional contribution to the world of dance and theatre. Forsyth received a Royal Television Society Lifetime Achievement Award on 17 March 2009. On 26 January 2011 he received the National Television Awards special recognition award. Forsyth was made a Knight Bachelor in the 2011 Birthday Honours for services to entertainment and charity. This followed a years-long public campaign to award him a knighthood. His investiture, by the Queen, took place on 12 October 2011 and he became Sir Bruce Forsyth CBE. In July 2012, Forsyth was given the honour of carrying the Olympic flame through London, as it finally reached the city on the penultimate day of the London 2012 Torch Relay. Forsyth earned a place in the 2013 Guinness Book of World Records as the male TV entertainer having had the longest career, calling it a "wonderful surprise". He also appeared at the 2013 Glastonbury Festival on the Avalon stage, becoming the oldest performer to ever play at the festival.. In 2018 the NTA's honoured the memory of Sir Bruce by naming an NTA award after him. Forsyth was married to Penny Calvert from 1953 until their divorce in 1973, with whom he had three daughters named Debbie, Julie, and Laura. In 1973, he married Anthea Redfern, the hostess on The Generation Game. They had two daughters, Charlotte and Louisa, before divorcing in 1979. Asked to judge the 1980 Miss World competition, Forsyth met Puerto Rican beauty queen Wilnelia Merced, who was a fellow judge. They were married from 1983 until his death in 2017. They had one son together, Jonathan Joseph, better known as "JJ". By his six children, Forsyth had nine grandchildren and three great-grandchildren. Forsyth was a supporter and ambassador for the children's charity Caudwell Children, regularly appearing at many of their fundraising events. In August 2014, Forsyth was one of 200 public figures who signed a letter to The Guardian expressing their hope that Scotland would vote to remain part of the United Kingdom in September's referendum on that issue. Forsyth lived at the exclusive Wentworth Estate in Surrey. Until 2000, he also occupied a flat in Nell Gwynn House, Sloane Avenue, Chelsea. Towards the end of his life, Forsyth suffered from ill health, which reduced his appearances in public. On 8 October 2015, he was admitted to hospital for cuts and minor concussion after tripping over a rug at his home and hitting his head. A month later, he made his last full TV appearance on Strictly Children in Need Special, with filming for this taking place prior to him undergoing surgery for an abdominal aortic aneurysm on 12 November. As a result of his surgery, Forsyth was unable to host that year's Strictly Come Dancing Christmas Special as planned, but a spokesman representing him later stated he would play a part in the production, recording a special video message for it. After 2015, Forsyth made no further public appearances, as his health began to decline, with his wife commenting that he struggled to move easily following his surgery. On 26 February 2017, he was again admitted to hospital with a severe chest infection and spent five days in intensive care, before returning home on 3 March 2017. On 18 August 2017, Forsyth died of bronchial pneumonia at his Wentworth Estate home in Virginia Water, aged 89. Several celebrities paid tribute to Forsyth following his death, including his former Strictly Come Dancing co-host Tess Daly; his friends Michael Parkinson, Jimmy Tarbuck, and Des O'Connor, the BBC director general Tony Hall and Prime Minister Theresa May. BBC One aired Sir Bruce Forsyth – Mr Entertainment, in place of the scheduled The One Show, in tribute. Forsyth was cremated on 5 September 2017 in a private ceremony attended only by close family and friends. A few days later, on 9 September 2017, when that year's series of Strictly Come Dancing began, it paid tribute to Forsyth with a special ballroom dance routine from their professional dancers. On 14 December 2017, BBC announced that it would produce a tribute show to Forsyth at the London Palladium on 21 February 2018. Hosted by Tess Daly, Sir Bruce: A Celebration was broadcast on BBC One on 11 March 2018. On 18 August 2018, exactly a year after he died, Forsyth's ashes were laid to rest beneath the stage in a private ceremony at the London Palladium. ^ He was guest host for three specials after 2013 – the Children in Need specials in 2014 and 2015, and the 2014 Christmas Special. He made a guest appearance for the 2015 Christmas Special via Video Message. ^ "Sir Bruce Forsyth breaks TV career world record". Guinness World Records. 7 September 2012. Retrieved 26 August 2014. ^ "Sir Bruce Forsyth steps down from Strictly Come Dancing". BBC News. 4 April 2014. ^ "Why I have done so well, by Bruce Forsyth, great-grandfather, at 80", The Times, 23 February 2008. Retrieved 23 February 2008. ^ "Bruce Forsyth Biography (1928–)". ^ a b c d Cooke, Rachel (16 December 2007). "Didn't he do well ..." The Guardian. London. Retrieved 4 January 2008. ^ "Bruce Forsyth discovers 'bigamist' in his family tree". BBC News. London: BBC. 19 July 2010. Retrieved 19 July 2010. ^ Barratt, Nick (6 December 2006). "Family detective: Bruce Forsyth". The Telegraph. London. Retrieved 27 April 2010. ^ Wintle, Angela (14 April 2012). "Bruce Forsyth: My family values". The Guardian. Retrieved 18 August 2017. ^ "Commonwealth War Graves Commission". Retrieved 19 August 2017. ^ a b c d Loxley, Tom (5 April 2014). "9 facts you might not know about Sir Bruce Forsyth". Radio Times. Retrieved 18 August 2017. ^ "BFI Screenonline: Forsyth, Bruce (1928–) Biography". ^ Eames, Tom (18 August 2017). "Sir Bruce Forsyth dies: Remembering the iconic TV host, entertainer and Strictly Come Dancing star". Digital Spy. Retrieved 18 August 2017. ^ "Sir Bruce Forsyth to celebrate 70 years in Showbiz on the BBC". ATV Today. 20 March 2013. Retrieved 18 August 2017. ^ "I'm in Charge". Archive on 4. Retrieved 18 August 2017. ^ "60 years of Sunday Night at the Palladium: A look back at some classic archive shots". British Telecom. Retrieved 18 August 2017. ^ Barker, Dennis (14 November 2005). "Obituary: Avril Angers". The Guardian. Retrieved 18 August 2017. ^ Adler, Renata (23 October 1968). "Screen: 'Star!' Arrives:Julie Andrews Featured in Movie at Rivoli". The New York Times. Retrieved 18 August 2017. ^ "Back Britain drive hits chord in music field". Billboard: 40. 20 January 1968. ^ "Song for the typists" (Business Diary), The Times, 8 January 1968, p. 19. ^ Craig Brown, "Way of the world: A mutual case of wow", Daily Telegraph, 4 June 2005, p. 23. ^ McClatchey, Caroline (8 November 2011). "Buy British: Why isn't there a new campaign?". BBC News. Retrieved 18 August 2017. ^ Forsyth, Bruce (2015). Strictly Bruce: Stories Of My Life. Penguin Random House. ISBN 9780593075982. Retrieved 18 August 2017. ^ a b c Sellers, Robert (18 August 2017). "Bruce Forsyth: The face of Saturday night television who has died at the age of 89". The Independent. Retrieved 18 August 2017. ^ a b "The stars share their Muppet memories". Radio Times. Retrieved 18 August 2017. ^ Hawkes, Rebecca (30 September 2015). "BFI to show entire night of television recorded in 1964". The Daily Telegraph. Retrieved 18 August 2017. ^ "Sir Bruce Forsyth's old-fashioned appeal". BBC News. 4 April 2014. Retrieved 18 August 2017. ^ "Sir Bruce Forsyth dies aged 89". Classic FM. 18 August 2017. Retrieved 18 August 2017. ^ "Forsyth's old-fashioned appeal". BBC News. 31 December 2005. Retrieved 18 August 2017. ^ Dean, Will (18 December 2014). "The Fight for Saturday Night, TV review: Top marks for Michael Grade's illuminating look at television's golden age". The Independent. Retrieved 18 August 2017. ^ a b Viner, Brian (26 October 2000). "Bruce Forsyth 'humiliated' by ITV director's lack of 'respect'". The Independent. Retrieved 18 August 2017. ^ "Play Your Cards Right, 1980". British Classic Comedy. 24 April 2015. Retrieved 18 August 2017. ^ a b "Bruce Forsyth: a timeline". The Daily Telegraph. 18 August 2017. Retrieved 18 August 2017. ^ Bettridge, Daniel (9 February 2012). "Six to watch: Gameshow hosts". The Guardian. Retrieved 18 August 2017. ^ Belcher, David (10 April 1984). "TV". The Glasgow Herald. p. 26. Retrieved 18 August 2017. ^ Billings, Claire (30 October 2003). "Bruce Forsyth returns to TV with new quiz show on BBC". Campaign. Retrieved 18 August 2017. ^ "Stork". Unilever. Retrieved 18 August 2017. ^ Treanor, Jill (30 November 2004). "Courts furniture chain collapses". The Guardian. Retrieved 18 August 2017. ^ Trueman, Matt (24 November 2011). "Bruce Forsyth to celebrate 70 years in showbiz with stage show". The Guardian. Retrieved 18 August 2017. ^ Youngs, Ian (19 August 2017). "Sir Bruce Forsyth: 8 little-known facts about his career". BBC News – Entertainment & Arts. Retrieved 20 August 2017. ^ a b Heritage, Stuart (13 April 2012). "What makes the perfect Have I Got News For You host?". The Guardian. Retrieved 18 August 2017. ^ "Bruce Forsyth steps down as presenter of Strictly Come Dancing live shows". The Guardian. 4 April 2014. Retrieved 18 August 2017. ^ Sutcliffe, Tom (7 April 2010). "Last Night's Television: Bruce Forsyth: A Comedy Roast, Channel 4 Embarrassing Bodies: Charlotte's Story, Channel 4". The Independent. Retrieved 18 August 2017. ^ a b "Who Do You Think You Are?". BBC Online. Retrieved 23 July 2010. ^ "Series 3 – Episode 3 Piers Morgan's Life Stories: Bruce Forsyth". Radio Times. Retrieved 18 August 2017. ^ a b Corner, Lewis (12 October 2011). "Bruce Forsyth, granddaughter duet on album 'These Are My Favourites'". Digital Spy. Retrieved 18 August 2017. ^ "Profile: Bruce Forsyth". The Guardian. Retrieved 18 August 2017. ^ "SIR BRUCE FORSYTH CBE Blue Collar Rat". Grand Order of Water Rats. Retrieved 24 October 2017. ^ a b "Plymouth mourns Sir Bruce Forsyth after his death aged 89". Plymouth Herald. 18 August 2017. Retrieved 18 August 2017. ^ "No. 55155". The London Gazette (Supplement). 15 June 1998. p. 11. ^ "No. 57855". The London Gazette (Supplement). 31 December 2005. p. 7. ^ a b "Nice to see you: bust marks Bruce Forsyth's six decades in showbiz". The Independent. Retrieved 15 August 2017. ^ Osborn, Michael (20 April 2008). "Brucie's big night at TV awards". BBC News. Retrieved 18 August 2017. ^ "Results of the 2009 Carl-Alan Awards" (PDF). Archived from the original (PDF) on 27 March 2009. ^ "Programme Awards Winners 2008". Royal Television Society. 2009. Retrieved 6 July 2011. ^ "Winners 2011". National Television Awards. 26 January 2011. Archived from the original on 14 November 2010. Retrieved 26 January 2011. ^ "No. 59808". The London Gazette (Supplement). 11 June 2011. p. 1. ^ "Sir Bruce Forsyth collects knighthood from the Queen". BBC News. BBC. 12 October 2011. Retrieved 12 October 2011. ^ Hirst, Michael (26 July 2012). "Olympic torch: BBC greets flame and Sir Bruce Forsyth". BBC News. BBC. Retrieved 3 December 2012. ^ "Sir Bruce Forsyth becomes record breaker". BBC. 7 September 2012. Retrieved 7 September 2012. ^ "Sir Bruce Forsyth acknowledged for long career with Guinness World Record". The Independent. London. 7 September 2012. Retrieved 7 September 2012. ^ MacInnes, Paul (30 June 2013). "Bruce Forsyth at Glastonbury 2013 – review". The Guardian. Retrieved 18 August 2017. ^ a b Selby, Jenn (20 April 2015). "Bruce Forsyth backs assisted dying campaign: 'If I had Alzheimer's or dementia I would do something about it'". The Independent. Retrieved 18 August 2017. ^ "Bruce Forsyth". The Observer. London. 12 December 2004. Retrieved 27 April 2010. ^ "Forsyth's six decades in limelight". BBC News. 6 May 2005. Retrieved 18 August 2017. ^ Glanfield, Tim (18 August 2017). "Bruce Forsyth: "Not just another British entertainer; he was the embodiment of British entertainment"". Radio Times. Retrieved 18 August 2017. ^ "Celebrity ambassadors". Caudwell Children. Retrieved 19 October 2013. ^ "Picture – Bruce Forsyth | Photo 3051844". Contactmusic.com. Retrieved 19 October 2013. ^ "Luxury living at the Wentworth Estate: home to royalty, business tycoons and Sir Bruce Forsyth". Retrieved 18 August 2017. ^ "Top 20 celebrity retirement hot spots". Retrieved 18 August 2017. ^ Khomami, Nadia. "Sir Bruce Forsyth taken to hospital after fall at home | Television & radio". The Guardian. Retrieved 21 December 2015. ^ "Bruce Forsyth recovering after surgery for aneurysm". BBC News. BBC. Retrieved 21 December 2015. ^ Foster, Patrick (3 December 2015). "Sir Bruce Forsyth pulls out of Strictly Come Dancing Christmas special over health". Telegraph. Retrieved 21 December 2015. ^ "Obituary: Sir Bruce Forsyth". BBC. 18 August 2017. ^ "Sir Bruce Forsyth spends five days in intensive care with chest infection". Daily Telegraph. 3 March 2017. Retrieved 18 August 2017. ^ "Sir Bruce Forsyth: King of UK gameshows dies aged 89". The Guardian. 18 August 2017. Retrieved 18 August 2017. ^ "Sir Bruce Forsyth: TV legend dies aged 89". BBC News. 18 August 2017. Retrieved 18 August 2017. ^ "Sir Bruce Forsyth: Tributes paid to 'a national hero'". BBC News. 18 August 2017. Retrieved 18 August 2017. ^ Westbrook, Caroline. "BBC One to air tribute to Bruce Forsyth in place of The One Show in the wake of his death". Metro. Retrieved 18 August 2017. ^ "Sir Bruce Forsyth's private funeral held". BBC News. BBC. 5 September 2017. Retrieved 5 September 2017. ^ "Bruce: A Celebration to air on BBC One". BBC Media Centre. BBC. 14 December 2017. Retrieved 18 January 2018. ^ "Sir Bruce: A Celebration". BBC. Retrieved 11 March 2018. ^ "Bruce Forsyth's ashes laid to rest at London Palladium". Raidió Teilifís Éireann. 20 August 2018. Retrieved 21 August 2018. ^ a b c d e f g h i j k l m n o p q r s t u v w x y z aa ab ac ad ae af ag ah "Bruce Forsyth". BFI. Retrieved 15 August 2017. ^ "Bruce Forsyth meets Lulu". BBC. Retrieved 19 August 2017. ^ "The Rob Brydon Show". Comedy.co.uk. Retrieved 15 August 2017. ^ "Little Ant and Dec meet Bruce Forsyth". ITV.com. Retrieved 19 August 2017. ^ "Perspectives episode 6". ITV. Retrieved 19 August 2017. ^ Rogers, Bob (28 April 2015). "Bruce Forsyth proves he can still work a crowd as he entertains Cardiff audience". Retrieved 19 August 2017. ^ Coveney, Michael (18 August 2017). "Sir Bruce Forsyth obituary: a TV presenter in a class of his own". Retrieved 19 August 2017 – via The Guardian. ^ Forsyth, Bruce. Bruce:The Autobiography. ISBN 9780330475945. ^ a b c "Sir Bruce Forsyth obituary". Guardian. Retrieved 19 August 2017. ^ "Tour archive for Bruce Forsyth". untw.co.uk. Retrieved 19 August 2017. ^ a b c d e f g h i j k "Bruce Forsyth discography". Discogs.com. Retrieved 19 August 2017. None Host of You Bet!